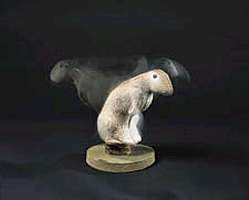 Predators won't be able to resist the lifelike quivering motion of this soft-sided electronic rabbit decoy. Its realistic injured-rabbit action is provided by a dependable motor with built-in timer - decoy sequence is 15 seconds on/15 seconds off. A round base allows placement almost anywhere. Requires four AA batteries (not included). When you place Feather Flex's lifelike rabbit decoy in a visible location and team it up with a highly effective Lohman predator call, you have the makings of a great hunt. 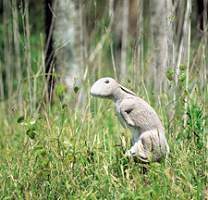 The Predator Rabbit is lightweight and collapsible, yet easily returns to its original shape. Wind-activated movement makes for an incredibly realistic presentation. Field stake provided. 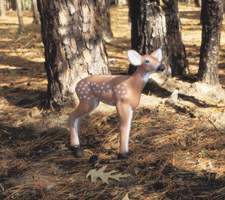 The Feather Flex fawn decoy works great for both deer and predators. Predators and Does alike respond aggressively to distressed fawn bleats especially when there is visual focus point to reinforce the bleat such as this very realistic fawn decoy. When used with a doe decoy, a buck will attempt to drive the fawn away from its mother to speed the doe into estrus.